The United States is one of only three countries in the world that DOES NOT guarantee paid maternity leave. You read that right. San Francisco is the only city within our country that guarantees a fully-paid leave of six weeks. The Infant mortality rate in the United States is staggering. RECORD YOUR BABY'S HEARTBEAT IN AN ADORABLE STUFFED ANIMAL! 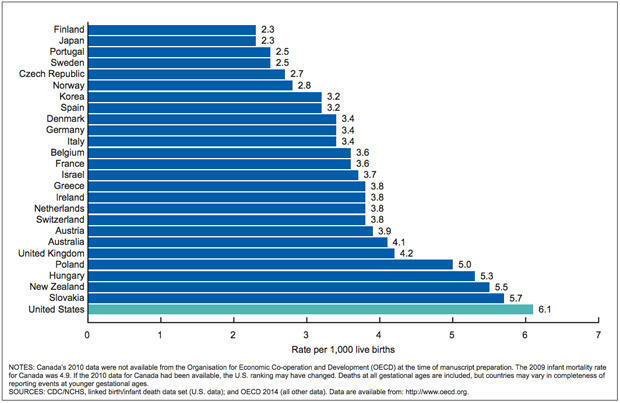 http://www.cdc.gov/nchs/data/nvsr/nvsr63/nvsr63_05.pdf “Among OECD countries, it is one of the worst performing in terms of neonatal and infant mortality rates,” Nandi said. The United States has a higher infant mortality rate than any of the other 27 wealthy countries, according to a report from the Centers for Disease Control. A baby born in the U.S. is nearly three times as likely to die during her first year of life as one born in Finland or Japan. That same American baby is about twice as likely to die in her first year as a Spanish or Korean one. Despite healthcare spending levels that are significantly higher than any other country in the world, a baby born in the U.S. is less likely to see his first birthday than one born in Hungary, Poland or Slovakia. Or in Belarus. Or in Cuba, for that matter. The U.S. rate of 6.1 infant deaths per 1,000 live births masks considerable state-level variation. If Alabama were a country, its rate of 8.7 infant deaths per 1,000 would place it slightly behind Lebanon in the world rankings. Mississippi, with its 9.6 deaths, would be somewhere between Botswana and Bahrain. We're the wealthiest nation in the world. How did we end up like this? The U.S. rate of 6.1 infant deaths per 1,000 live births masks considerable state-level variation. If Alabama were a country, its rate of 8.7 infant deaths per 1,000 would place it slightly behind Lebanon in the world rankings. Mississippi, with its 9.6 deaths, would be somewhere between Botswana and Bahrain. We're the wealthiest nation in the world. How did we end up like this? The U.S. rate of 6.1 infant deaths per 1,000 live births masks considerable state-level variation. If Alabama were a country, its rate of 8.7 infant deaths per 1,000 would place it slightly behind Lebanon in the world rankings. Mississippi, with its 9.6 deaths, would be somewhere between Botswana and Bahrain. We're the wealthiest nation in the world. How did we end up like this? We treat pregnancy as an illness here. We intervene with labor and birth. We have a domino effect of problems that should never occur. On top of it all, we have set the expectation for mothers to return to work immediately after giving birth or they will lose their paycheck. It is an embarrassment that we are treating our new mothers and infants this way. It's time to look at the numbers and make some big changes.